Along with the Yankees, the Tigers are the poster children for success with expensive, elite veterans. They lost Max Scherzer over the offseason, but he was preemptively replaced last summer by David Price. With the exception of the Twins, the AL Central has four viable contenders including the AL Champions and my favorite roster (the Indians). Detroit's rotation has been a strength for the entirety of their current playoff run. This season could test that trend. Price is a star, but the other options have their warts. The lineup remains thumptastic, but age could start to cut into production via normal decline or injury. You know that guy Cliff Lee? The one who dominated opponents for six straight seasons with plus stuff and a low walk rate? Price is a higher ceiling version of him. He keeps hitters off balance with a 94 mph fastball, sinker, cutter, curve, and change. His 9.82 K/9 and 1.38 BB/9 hint at better results than his 3.26 ERA. Ignore a few rough starts at the beginning of the year and he's a sub-3.00 ERA pitcher. He's the sixth overall pitcher, and he's well worth the price. With plenty of run support, he's one of the easiest bets for a 20 win season. Two flawed hurlers are available later in the draft. Sanchez and Verlander are the 46th and 47th starting pitchers per NFBC ADP. Sanchez remains effective, but he's often on the disabled list. He has a five pitch repertoire, although his curve is a show-me offering. He mainly drops it in as an unexpected first pitch. Despite good stuff and three seasons over 30 starts, he's never eclipsed 200 innings pitched. Fantasy owners sometimes allow him to drop in favor of younger options. For example, I found him 229th overall in the Yahoo F&F League. If Sanchez is an injury risk, Verlander is a complete enigma. His velocity is up to 94 mph this spring, but he's still producing bad results – a 5.36 ERA, 10 strikeouts, and six walks in 16 innings. I once thought that Verlander was the kind of pitcher who could succeed without elite velocity. Certainly, he wouldn't post a 2.40 ERA in 250 innings, but a more modest 3.50 ERA with solid peripherals seemed reasonable. Now I'm not sure if he has the required stuff. His four pitch mix plays like a back of the rotation pitcher without elite velocity. He remains a rebound candidate, but his days as a fantasy star are probably over. He's also dealing with forearm tightness this spring. The Yankees sold high on Greene after his strikeout rate spiked upon promotion to the majors. He allowed a 3.78 ERA with 9.27 K/9 and 3.32 BB/9 in 78.2 innings. His fastball and sinker are merely average, but his cutter and slider rate as plus pitches. I'd like to see him swap out some sinkers for cutters. He's a young pitcher with upside – just be prepared for developmental bumps. Beware Simon. His five pitch repertoire should allow him to contribute to the Tigers rotation. Your fantasy rotation will probably be glad to avoid a 4.00 ERA and low strikeout rate. When the Tigers need to reach past their top five, Buck Farmer and Kyle Lobstein are first in line. They could be worth a stream start against the right opponent. Nobody outside of Detroit thinks Nathan is a major league closer. Most (including me) wonder if he's even a major league pitcher. He has a 5.79 ERA with five strikeouts in 9.1 innings this spring. After posting 8.38 K/9, 4.50 BB/9, and a 4.81 ERA last year, his leash has to be short. Once Nathan is ousted, it'll be a battle between Soria and Rondon. Soria bounced back last season with a 3.25 ERA, 9.75 K/9, and 1.22 BB/9. He struggled upon returning from a late season injury. Soria is back to full health. Rondon spent most of the last two seasons on the disabled list for Tommy John surgery, and he is currently battling a neck issue. When healthy, he regularly touches triple digit velocity. We'll soon learn if that's still there. The lineup is the bread and butter of the Tigers attack. 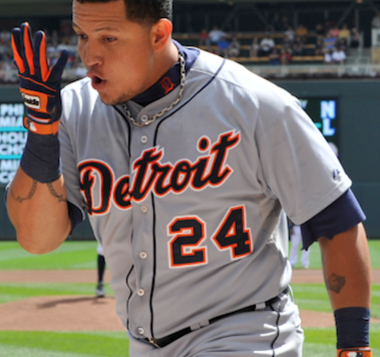 Injuries to Miguel Cabrera and Victor Martinez could leave the team stumbling out of the gate, but they'll both be back to full strength soon. Handicapping V-Mart is a difficult job. In his age 35 season, he hit a MVP quality .335/.409/.565 with a career high 32 home runs. An offseason knee injury has him likely to miss Opening Day, but he may not require a stint on the disabled list. We can count on his fantastic plate discipline; it's just hard to pencil him in for another 30 blasts. Offseason addition Yeonis Cespedes might steal the fifth spot in the lineup. The Cuban isn't quite as dynamic a hitter as Martinez, but he comes with bigger name recognition. His best attribute is 20 to 25 home run power. If I were in charge, he'd bat sixth. We'll see how he's actually used. If you have the roster flexibility, a straight platoon of Anthony Gose and Rajai Davis could easily outperform Billy Hamilton. Davis is excellent against left-handed pitching with a career .304/.358/.446 line. He's swiped over 20 bases in eight straight seasons. Gose will likely take most starts against righties. He offers less value across all categories, but he should easily steal 30 bases. Nick Castellanos is vaguely reminiscent of Nolan Arenado. When the Rockies third baseman debuted, the results were disappointing. However, there were signs of better things to come. The same is true with Castellanos. A high line drive rate speaks to his quality of contact. He managed better whiff rates in the minors, so he could improve in that regard. A breakout season could include a .280/.330/.450 performance with 20 home runs. Of course, expect considerably less. The Tigers are the seventh team in our power rankings. Age is beginning to sap the value of the roster, specifically through increased injury risk. However, with so many stars and a dynamic lineup, the team should be a fantasy juggernaut. The pitching staff – especially the bullpen – is of great concern. The team insists on standing by Nathan, but they would have been better served by selecting his replacement during the spring.